Daniel believes there is evidence of alien influence on humanity outside of the Goa'uld appropriation of our mythology if indeed the myths came first or the Goa'uld did. Regardless Daniel has evidence based upon Norse legends that their gods may have been more "helpful" to humanity and Teal'c chimes up that he recognises one of the symbols as a gate address which they are forbidden to access. Of course that is all Jack and the General need to green light a mission and SG1 gate to what they come to know as the planet Cimmeria only to be faced with some easily amused natives who chant "thor, thor, thor" as an Obelisk powers up and fires a beam of light at the team. It focuses on Teal'c and his symbiote and as it reaches a crescendo Jack throws himself towards Teal'c and then they both vanish. The two men later awake in a dark, dank cavern and come across a hologram of a Viking warrior who proceeds to tell them that they came to a protected planet and are in violation of a treaty, there is a way out but only if the symbiote sacrifices itself. Meanwhile Sam and Daniel meet a local leader named Gairwyn who understands who and where they come from and takes them to meet the only person who has been taken by the obelisk and returned to tell the tale. Jack and Teal'c soon learn that they are not alone in the cavern/cave system, a very old Unas one of the first hosts of the Goa'uld symbiotes remains active and is very hungry and the two men have to fight off the James Earl Jones voiced alien while trying to reach the hammer and freedom. Sam and Daniel meet Kendra ( Galyn Görg ) who after asking for guidance from the gods agrees to take them into the mountains to find the exit of this trap. 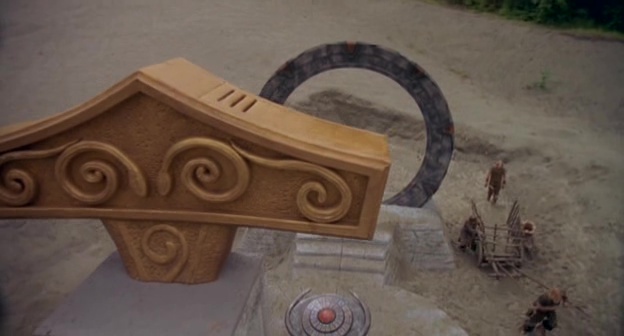 Thor's Hammer is one of the first and most important cornerstones of the Stargate mythology, the existence of an alien race and treaty which protects some human worlds kinda derails the notion that the Goa'uld are unstoppable. We will learn far more about Thor's people as the seasons go on and while their story doesn't end that well the adventure is one of the high points of Stargates seventeen seasons. Galyn is also one of the performers who only appears once on the show but whose role and presence makes her appearance memorable. As always my gratitude to Brad for getting up nice and early to record with me and he'll be back, put money on that. The next episode will probably be The Torment of Tantalus and of course as is the norm I'd love to get more people on the podcast so drop me a line if you are interested. You can join me in the regular rewatch or pick a favourite episode, I'm not going to be to fussy since I've covered all 17 seasons on the Gatecast.